Context: Acne vulgaris is the most frequent skin condition that reduces patients' quality of life (QOL). Aims: The aim of the study is to determine the prevalence, clinical manifestations, predictors, and factors that influence QOL of female medical students with acne at King Abdulaziz University Hospital (KAUH), Jeddah. Settings and Design: A cross-sectional design was conducted at KAUH, Jeddah. Subjects and Methods: Four-hundred participants were selected through a stratified random sampling technique during the educational year 2016/2017. Data collection included the “Acne-Specific Quality of Life Questionnaire (Acne-QOL)” and “Hospital Anxiety and Depression Scale (HADS).” Clinical examination was conducted by a female clinician, with grading of acne by the global acne grading system. Statistical Analysis Used: Descriptive and inferential statistics were done. Logistic regression analysis was conducted. Results: The prevalence of acne among medical students was 58.8%. Combined type of acne was the most common clinical presentation. Predictors of acne were stress (P < 0.001), menstrual flaring (P < 0.001), and family history of the condition (P < 0.01). Females with severe acne had the lowest score (worse QOL) of all QOL domains compared to others (P < 0.05). Most of QOL domains were lower among students with psychological problems, anxiety, and depression (P < 0.5). Conclusions: Acne is prevalent among female medical students. Stress, menstrual flaring, and family history were the predictors. Acne-QOL was influenced by the severity of acne, psychological problems, anxiety, and depression. Screening of acne, with holistic management approach (by dermatologists and psychologists), is recommended. Acne vulgaris is an epidemic of chronic, multifactorial inflammatory skin disorder., It is the most frequent skin lesion which affects >80% of world's population during some periods of their life and 85% of adolescents in the developed countries. Acne affects 9.4% of the world's population, making it the most prevalent worldwide disease. The impact of acne on QOL and the factors which influence QOL of patients with acne is not well characterized in the Gulf countries. Our study was done to determine the prevalence, clinical manifestations, and the predictors of acne vulgaris among female medical students and to identify the factors that influence QOL of participants who had acne at King Abdulaziz University (KAU), Jeddah, Saudi Arabia. A cross-sectional study was conducted at KAU during the educational year 2016/2017. The study enrolled female medical students who completed the freshman year (2nd–6th year) and accepted to participate. A stratified random sample method was used and based on their educational grade. The sample size was determined by formula of calculation of sample size from the cross-sectional studies. Where “n” is the minimal sample, “z” is a constant (1.96), and “p” was assumed to be 55.5% according to a recent study from Riyadh. Hence, the minimal estimated sample to accomplish a precision of 0.05% at 95% confidence interval (CI) was 380 students, which was exceeded during field work to reach 400 participants, for the stratification purpose. Physical examination: physical examination was performed by a female dermatology resident to determine diagnosis and grading of acne. If acne was present, the type(s) was identified, and the severity of acne was graded using the global acne grading system (GAGS). Data were analyzed using SPSS version 21 (IBM SPSS Statistics 20, IBM Corporation, Armonk, NY, USA, 2014). Scoring of the continuous variable of Acne-QOL and each domain was calculated. Classification of anxiety and depression was done based on HADS (three categories). Anxiety and depression were then classified into two categories: having morbid condition (abnormal) or not having (normal and borderline). Descriptive statistics was performed. Inferential statistics was done with calculation of Chi-squared, odds ratio (OR), and 95% CI. Student's t-test and one-way analysis of variance with the least statistical difference were calculated. Pearson's correlation was done to determine associations between different Acne-QOL domains. Multiple linear regression was done to determine acne predictors. P < 0.05 was considered statistically significant. The mean age of the participants was 21.3 ± 1.4 years. Only 155 students (38.8%) were previously diagnosed as having acne by physicians and 134 of them (86.8%) received medical treatment of whom 48.4% received oral treatment; 10.7%, 32.7%, and 5.7% received topical, both oral and topical drugs, or other drugs, respectively. One-third of those who received treatment took over-the-counter drugs. The prevalence of acne among the participants was 58.8%. Based on the GAGS, 68.1%, 26.0%, and 5.9% of the participants had mild, moderate, and severe degrees, respectively. Mixed types of acne affected the majority (55.3%) of the participants. The most common separate types of acne were whiteheads (15.3%), blackheads (12.6%), papules (6%), cysts (4.2%), and nodules (3.7%). Acne was more common among younger (61.5%) compared to older students (54.8%) but without statistical significant difference (P > 0.05) [Table 1]. The rate of acne was higher among students who had family history acne (69.1%) compared to those without such history (43.9%), with a highly statistical significant difference (χ2 = 25.28, P < 0.001). In addition, menstruation and flaring of acne were associated (P < 0.001). Females with regular menstrual period had a slightly lower prevalence of acne compared to those with irregular menstruation (P > 0.05). Students who suffered from stress were about 6.5 times more liable to have acne compared to other students (OR = 6.53; 95% CI: 4.08–10.47) [Table 2]. Overweight and obese females had a higher acne prevalence (66.7%) compared to others (56.4%), but the difference was not statistically significant (P > 0.05). Students with systemic disease(s) had also a higher prevalence of acne compared to other. However, there is no statistical significant difference (P > 0.05). Poor social life was associated with a higher prevalence of acne (P < 0.05). Acne was not associated with anxiety and depression (P > 0.05). Acne was not associated also with eating chocolate or with eating other foods such as milk or fat. Regression analysis [Table 3] reveals that stress was the strongest acne predictor (adjusted OR [aOR] = 4.89; 95% CI: 2.98–8.01), followed by menstrual flaring (aOR = 2.42; 95% CI: 1.50–3.89) and family history of acne (aOR = 2.18; 95% CI: 1.38–3.45). Students with acne reported the highest mean score on the domain of self-perception, followed by role-emotional and finally the acne symptoms. The corresponding means (standard deviation) of the three domains were 22.18 (8.0), 21.77 (7.8), and 21.38 (5.0), respectively. 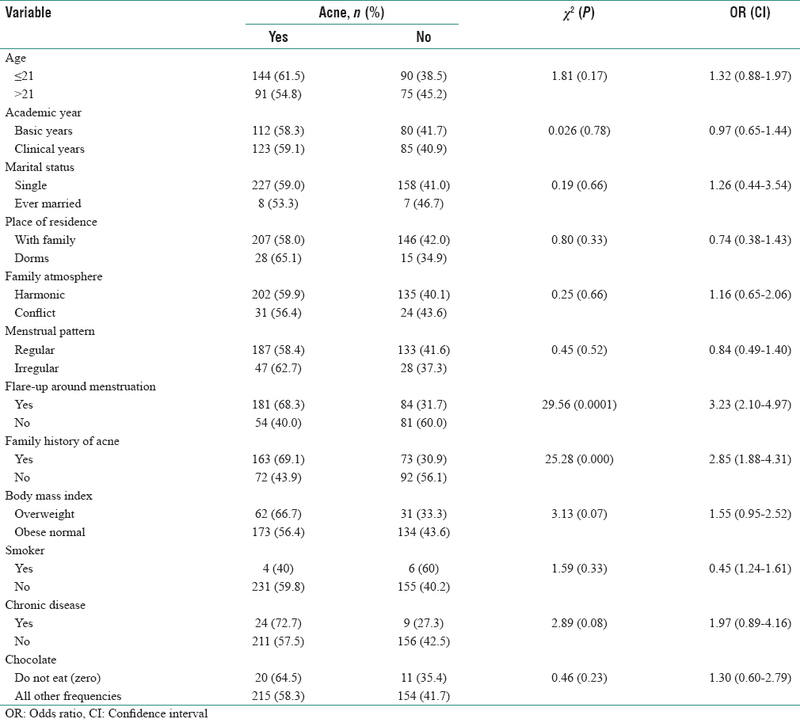 Age or academic grade of the students who had acne was not related to QOL domains [Table 4]. Similarly, the duration of acne did not affect the QOL. Students with easy scarring of their acne had lower scores of QOL domains compared to others. Statistically significant associations were found between easy acne scarring and each of the role-emotional and acne symptoms QOL domains. The impact of acne on different QOL domains was proportional to its severity. Medical students who had mild acne had the highest mean scores in all four QOL domains (better QOL), whereas those with severe acne had worse QOL. This relation was strongest in the role-emotional domain (F = 10.22 and P < 0.001). The Acne-QOL scores were lower among students with poor social life compared to the others (P < 0.05). The role-social domain was the most commonly affected domain by having poor social life, followed by acne symptoms. Anxiety and depression affected most of the QOL domains of the participants who had acne. Highly statistical significant associations were found between presence of morbid depression and each of self-perception, role-social, and role-emotional QOL domains (P < 0.001). On the other hand, role-social domain was the most affected QOL domain by the presence of morbid anxiety among females who had acne. The prevalence of acne among female medical students in the present study was 58.8%, which is within the range from previous two Saudi studies, and with a study done in seven European countries. However, our rate is lower than the prevalence reported from Portugal, Malaysia, and Southern India. This discrepancy may be attributed to differences between study populations, samples, time of studies, or due to conduction of physical examination in the current study. The present study revealed that only 38.8% of the females with acne were previously diagnosed by physician(s), which agrees with the results from Riyadh. The most common separate types of acne in our study were white and black heads, which agrees with results from Southern India. Furthermore, about two-thirds of our cases had mild acne, which coincides with a Greece's study. The current study illustrates significant association between presence of acne and family history of it, which agrees with previous studies., 14,18-21Such findings may support the genetic role in acne pathogenesis. Furthermore, 68.3% of the students with acne reported the presence of acne flaring during menstruation, which coincides with results from New York. This finding may be due to the influence of hormonal regulation. The current study revealed that stress was the strongest predictor of acne, which is in line with results from a multicenter case–control study. Because of stress, additional physiological mechanisms may be activated in the body including the immune, endocrine, and nervous systems. The neuroendocrine mechanism is suggested to play a big role in acne., Furthermore, experimental studies demonstrated that stressors affect both cutaneous and adaptive immunities. The current study reported the absence of an association between acne and consumption of chocolate. However, another study indicated that there is a correlation between chocolate consumption and increased acne exacerbation. Acne affects students' QOL and its impact on the four different domains was proportional to the severity of acne. This finding coincides with the results of Greece, Brazil, and Oman. Another study from Korea found that severe acne leads to emotional and social impairments. On the other hand, Gupta et al., Turkey, reported the absence of such association. This difference may be because Gupta's study did not use a standardized QOL questionnaire. 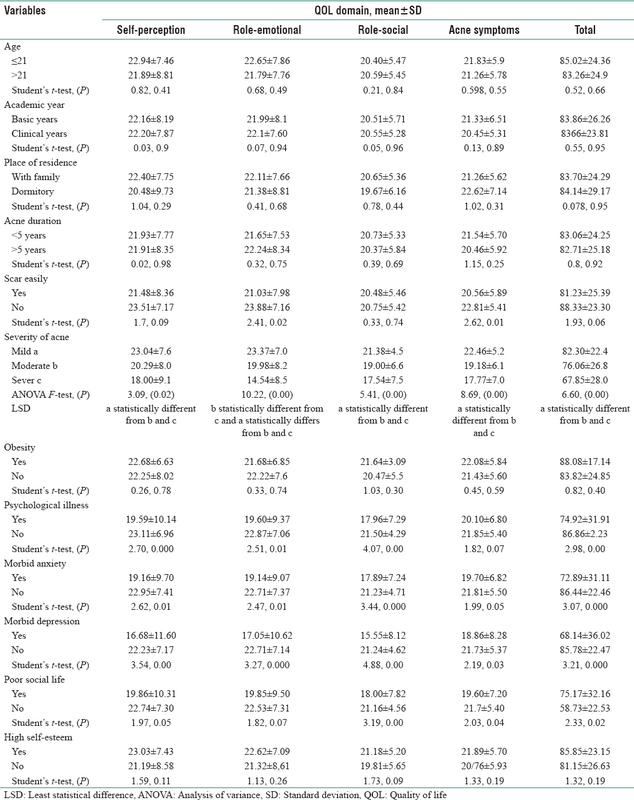 Results from the present study reported the absence of significant association between age of students with acne and their QOL, which agrees with results from two Turkish studies., Furthermore, we found that Acne-QOL domains were positively associated with anxiety, depression, and psychological problems, which agree also with the Turkish study. Acne vulgaris prevailed among female medical students from KAU. Most of the cases had a mild form, and the white/black heads were the most common separate types. The predictors of acne were stress, menstrual flaring, and presence of family history. QOL was influenced by the severity of acne, anxiety, depression, and psychological problems. Screening programs and management of acne are recommended. Holistic and interdisciplinary approaches, involving both dermatologists and psychologists, are needed for caring of acne cases. Melnik BC. Acne vulgaris: The metabolic syndrome of the pilosebaceous follicle. Clin Dermatol 2018;36:29-40. Al-Shidhani A, Al-Rashdi S, Al-Habsi H, Rizvi S. Impact of acne on quality of life of students at Sultan Qaboos University. Oman Med J 2015;30:42-7. Tan JK, Bhate K. A global perspective on the epidemiology of acne. Br J Dermatol 2015;172 Suppl 1:3-12. Ghodsi SZ, Orawa H, Zouboulis CC. Prevalence, severity, and severity risk factors of acne in high school pupils: A community-based study. J Invest Dermatol 2009;129:2136-41. Muthupalaniappen L, Tan HC, Puah JW, Apipi M, Sohaimi AE, Mahat NF, et al. Acne prevalence, severity and risk factors among medical students in Malaysia. Clin Ter 2014;165:187-92. Gieler U, Gieler T, Kupfer JP. Acne and quality of life – Impact and management. J Eur Acad Dermatol Venereol 2015;29 Suppl 4:12-4. Wang WE, editor. Clinical Epidemiology-basic Principles and Practical Applications. Beijing: Higher Education Press Publication; 2012. p. 101. Alajlan A, Al Turki YA, AlHazzani Y, Alhowaish N, AlEid N, Alhozaimi Z, et al. Prevalence, level of knowledge and lifestyle association with acne vulgaris among medical students. J Dermatol Dermatol Surg 2017;21:58-61. Bolarinwa OA. Principles and methods of validity and reliability testing of questionnaires used in social and health science researches. Niger Postgrad Med J 2015;22:195-201. Martin AR, Lookingbill DP, Botek A, Light J, Thiboutot D, Girman CJ, et al. Health-related quality of life among patients with facial acne – Assessment of a new acne-specific questionnaire. Clin Exp Dermatol 2001;26:380-5. Ibrahim N, Al-Kharboush D, El-Khatib L, Al-Habib A, Asali D. Prevalence and predictors of anxiety and depression among female medical students in King Abdulaziz University, Jeddah, Saudi Arabia. Iran J Public Health 2013;42:726-36. Al Robaee AA. Prevalence, knowledge, beliefs and psychosocial impact of acne in university students in central Saudi Arabia. Saudi Med J 2005;26:1958-61. Wolkenstein P, Machovcová A, Szepietowski JC, Tennstedt D, Veraldi S, Delarue A, et al. Acne prevalence and associations with lifestyle: A cross-sectional online survey of adolescents/young adults in 7 European countries. J Eur Acad Dermatol Venereol 2018;32:298-306. Gonçalves G, Amado JM, Matos ME, Massa A. The prevalence of acne among a group of portuguese medical students. J Eur Acad Dermatol Venereol 2012;26:514-7. Joseph N, Kumar GS, Nelliyanil M. Skin diseases and conditions among students of a medical college in Southern India. Indian Dermatol Online J 2014;5:19-24. Tasoula E, Gregoriou S, Chalikias J, Lazarou D, Danopoulou I, Katsambas A, et al. The impact of acne vulgaris on quality of life and psychic health in young adolescents in Greece. Results of a population survey. An Bras Dermatol 2012;87:862-9. Mina-Vargas A, Colodro-Conde L, Grasby K, Zhu G, Gordon S, Medland SE, et al. Heritability and GWAS analyses of acne in australian adolescent Twins. Twin Res Hum Genet 2017;20:541-9. Geller L, Rosen J, Frankel A, Goldenberg G. Perimenstrual flare of adult acne. J Clin Aesthet Dermatol 2014;7:30-4. Stoll S, Shalita AR, Webster GF, Kaplan R, Danesh S, Penstein A, et al. The effect of the menstrual cycle on acne. J Am Acad Dermatol 2001;45:957-60. Di Landro A, Cazzaniga S, Cusano F, Bonci A, Carla C, Musumeci ML, et al. Adult female acne and associated risk factors: Results of a multicenter case-control study in Italy. J Am Acad Dermatol 2016;75:1134-410. Jović A, Marinović B, Kostović K, Čeović R, Basta-Juzbašić A, Bukvić Mokos Z, et al. The impact of pyschological stress on acne. Acta Dermatovenerol Croat 2017;25:1133-141. Bhate K, Williams HC. Epidemiology of acne vulgaris. Br J Dermatol 2013;168:474-85. Lynn DD, Umari T, Dunnick CA, Dellavalle RP. The epidemiology of acne vulgaris in late adolescence. Adolesc Health Med Ther 2016;7:13-25. Kamamoto Cde S, Hassun KM, Bagatin E, Tomimori J. Acne-specific quality of life questionnaire (Acne-qoL): Translation, cultural adaptation and validation into Brazilian-portuguese language. An Bras Dermatol 2014;89:83-90. Do JE, Cho SM, In SI, Lim KY, Lee S, Lee ES, et al. Psychosocial aspects of acne vulgaris: A community-based study with korean adolescents. Ann Dermatol 2009;21:125-9. Duman H, Topal IO, Kocaturk E, Duman MA. Evaluation of anxiety, depression, and quality of life in patients with acne vulgaris, and quality of life in their families. Dermatol Sin 2016;34:6-9.